Sometimes less is more when it comes to a restaurant design or concept. Depending on your restaurant theme, you can get away with many inexpensive design tricks. To help you get started, here are some ideas for creating an inviting dining space without breaking your start-up budget. Linens are great for banquets, weddings, and other catered events, but using them in a restaurant dining room can be costly. Regular cleaning, pressing, and replacement costs quickly add up. Plus, linen tablecloths can send the wrong message to potential customers. They may think your establishment is too fancy or too expensive for their budget and move on to a place they feel more comfortable. Instead of a full linen service try just using linen napkins, which add a simple sense of formality without overdoing it. Roll silverware inside the napkin for an easy place setting. Linen napkins can be washed and dried in-house, saving you on cleaning bills. You could also try paper tablecloths, which are also great for kids to color on while they wait for dinner. Instead of sending your menus to a professional printer and having them laminated, purchase simple menu jackets and create your menu with your PC and printer. 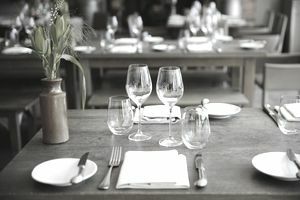 There are so many options available with standard publishing software, you can create a customized menu that will fit in with your restaurant design at a fraction of the price of having them done professionally. One idea is to use kids drawings for the front and backs of the menus. Ask kid customers to draw their version of your restaurant and voila! Instant art that will be as unique as your restaurant concept. There are free programs you can use to put together the final design yourself. Wait staff uniforms are just as much a part of your restaurant design as the furniture or artwork. A waiter in a white shirt and tie sends a very different vibe than a server in a t-shirt and jeans. Instead of investing in heavy-duty button-down shirts with an embroidered logo, try a t-shirt, which can cost a great deal less, especially when you are buying in bulk. A bonus of the staff wearing t-shirts is that you can sell them to customers as well. You can even have the staff dress in their own clothes, which is the cheapest uniform of all and requires no investment from you. One of my favorite restaurants has a Mona Lisa painted on the wall in their ladies restroom. In the men's restroom there is a wall mural of Polaroid’s featuring urinals from around the world. Neither of these decorations put too big of a dent in the owner's pockets. When planning your restaurant design, don’t be afraid to do something unique. If thinking up cool restaurant bathroom designs isn’t your strong point, ask some creative friends for ideas. Another bathroom favorite is a vintage prom dress stapled to a door to let you know that it’s the ladies' room. Or how about an old gasoline pump from the 1950’s perched on a ledge overlooking the dining room? With a little imagination, almost anything can be part of a unique restaurant design.